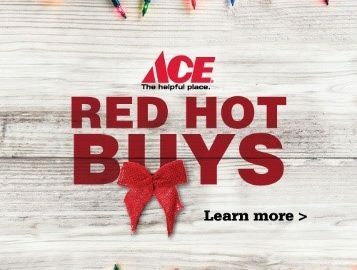 Starting November 1, save big on all our Ace Red Hot Buys for November. Get Christmas ready with 20% off select LED light sets, wreaths, garland and projectors. Additionally, you’ll find savings on big brands like Weber, DeWalt, Craftsman and Stanley. Ace Rewards members receive extra savings on already low prices. Our helpful associates at Draper, Murray, Olympus Hills and Sandy are eager to help you, visit us today.